What is the Best Dog Food For Italian Greyhounds? This dog breed is elegant, slender, and strong. It’s the smallest of the ‘sighthounds’—though it balances this with a high intelligence and big personality! 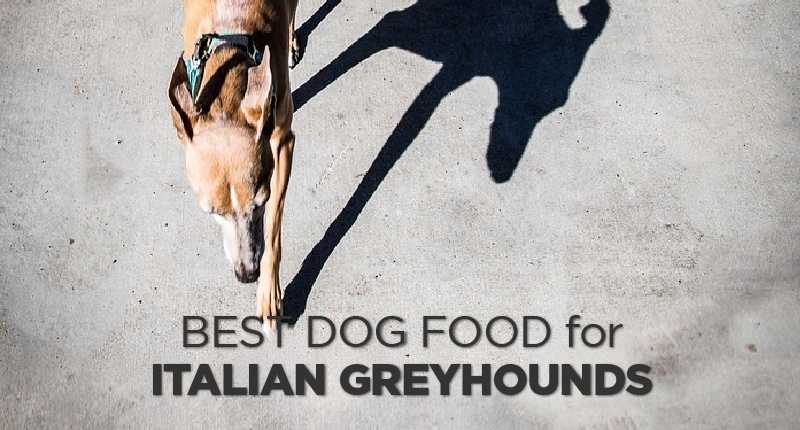 But what’s the best food for Italian Greyhounds? What do you feed a dog that’s both slender and powerful at the same time? Here’s what we found out. The Italian Greyhound stands about 1 foot, 2 inches tall, and will end up weighing anywhere from 7 to 18 pounds. It’s graceful, agile, and surprisingly strong for a dog of its size—but that doesn’t mean that it’s an animal with ‘small’ dietary requirements. Greyhounds, like all other dogs, require a diet that’s rich in nutritional value and lean protein. A less active dog of this breed will need about 360 calories of quality dog food per day, while a dog that’s moderately active will probably need more like 450. An Italian Greyhound that’s highly active, on the other hand, may eat a bit more—as many as 700 calories or more per day. Also remember that all dogs are individuals, and that each one will have unique energy and calorie requirements. A dog that runs around all the time is probably going to need more calories than a couch potato—so take this into account when deciding on portion sizes for your Greyhound. If you’d like to learn more about Italian Greyhounds, I would definitely recommend that you check out this video. It was posted by The Pet Collective, and is part of a series titled Doglopedia. It provides some awesome information about the basics of the breed, and would be worth a look to anyone interested in these small, yet amazingly-built creatures. Italian Greyhounds seem to do better on a grain-free kibble, as this type of a formulation will provide a more diverse range of proteins, amino acids, vitamins, and minerals. It also helps to cut down on filler—which lowers the cost of the food but adds pretty much nothing in terms of quality. Unfortunately, this breed tends to deal with quite a few different eye problems—so a diet that’s rich in vision-healthy ingredients is a must. A dog food kibble that contains ingredients like fish, blueberries, kale, or broccoli could do a lot to help fortify eye-health for this breed. The Greyhound also needs plenty of B Vitamins, as these help to promote better reflexes and a healthier nervous system. Vitamin C will help to keep the joints healthy, as will extra levels of glucosamine and chondroitin. Above all else, try to feed your pet a diet that’s low on fillers and filled with quality sources of nutrition. A high-quality kibble is definitely going to be more effective for your canine than a cheap dog food brand that’s filled with wheat or corn product. Greyhounds tend to be a pretty healthy dog breed—but that doesn’t mean that they don’t occasionally suffer from health problems. Of course, a lot of different conditions can be ruled out by finding a reputable breeder who tests for genetic diseases in the parents before breeding. But still—even so, there are still some problems that can pop-up unannounced. Here are some of the most common diseases that tend to afflict the Italian Greyhound as a breed. Not every dog is going to end up with one of these—but it’s always a good idea to stay informed, just in case. This condition is characterized by a blue or grey cloudiness that affects one or both eyes. It may or may not affect the dog’s vision right away, but if left unchecked it likely will. You can correct it through surgery, though there are definitely some foods that can help to prevent it as well. A diet that’s rich in foods like cold water fish, blueberries, broccoli, carrots, pumpkin, kale, and garlic can do a lot to help prevent vision problems, as they contain vital nutrients that can help to keep the eyes functioning at maximum capacity. Vision is important for an athletic dog-breed like this—so make sure to take your Greyhound for vision check-ups as regularly as possible. You can learn more about cataracts here. Unfortunately, there’s not much that can be done about this disease outside of managing wounds when the dog receives them, and keeping your pet from engaging in activities that could potentially cause bleeding. In general, you can improve the eye health of your dog by feeding him/her a dog food that contains ingredients like cold water fish, blueberries, pumpkin, kale, and broccoli—though since this is an inherited condition, you may not be able to prevent it altogether through diet alone. Italian Greyhound puppies are typically weaned by the time they’re 5 weeks old, and are ready for adoption by week 8. Pups of this breed definitely need socialization to fit in well with other animals, which is why it’s important to leave them with the litter for as long as possible before their human-family takes them home. It’s also important that Greyhound puppies be handled by humans from a very early age, as this will keep them from being timid and shy as they grow and mature. Most Italian Greyhound pups (or ‘Iggys’) tend to weigh about 3 pounds by the time they’re 10 weeks old—and will require about 140 calories per day to stay fueled and energized as they grow and explore. Feeding puppy kibble in the beginning might be a good idea—though you can transition away from it about the time the dog is reaching its adult size. So, What’s the Best Dog Food for Italian Greyhounds? We’ve done quite a bit of research to answer this question, and really felt like Merrick Grain Free Real Salmon Sweet Potato Recipe simply stood out amongst the crowd. There are obviously a lot of high quality foods on the market nowadays, but Merrick Grain Free really seemed to ‘have it where it counted’ for Italian Greyhounds, in almost every sense of the word. For the breed’s vision problems, this dog food formulation contains ingredients like whitefish meal and blueberries—both of which are excellent for overall eye-health in canines. It’s also grain free, and packed with B Vitamins to give the Greyhound all of the nervous-system and reflex support he/she needs. It’s also packed with antioxidants, and contains enough glucosamine and chondroitin to keep your dog’s joints and ligaments performing at maximum capacity! 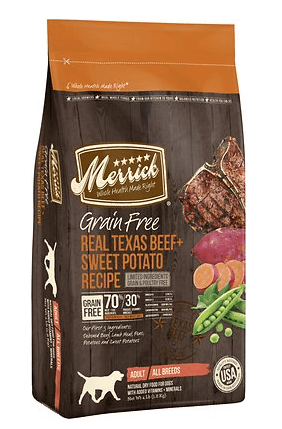 If you’re looking for a high-quality kibble that’s equipped to provide your Italian Greyhound with everything he or she will need to stay happy, healthy, and active, then I would definitely recommend that you give Merrick Grain Free Real Salmon Sweet Potato Recipe a try.